August is one of the craziest months for trade shows. Earlier this month we traveled to New York twice. First we exhibited at Accessories, The Show and after that the New York Gift Show. With everyone more than tentative about the economy, I was nervous. Both show turned out well. In spite of shows shrinking a bit and traffic seemingly softer, we opened many new accounts including a few museums and hip clothing stores. And even better, a host of our existing clients reordered. I’m always happiest knowing our jewelry is selling through. I attribute some of the lighter traffic to a diminished number of tire kickers. Another observation: Many buyers are being more careful and actually taking notes and returning (yes “be backs”) later to order. In the past (good ‘ole days), this didn’t happen as often. 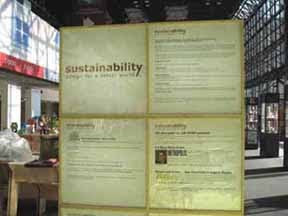 This was the third year Dunitz & Company had been chosen for participation in the New York Gift Show's "Sustainability - design for a better world" display. We've been tagged in the past because we are members of the Fair Trade Federation. This year the jury committee recognized us for using old buttons in our designs. We use loads of Czech glass buttons from the 40's and 50's. These creations have been some our most popular. It seems there are button collectors lurking in every corner – every town.